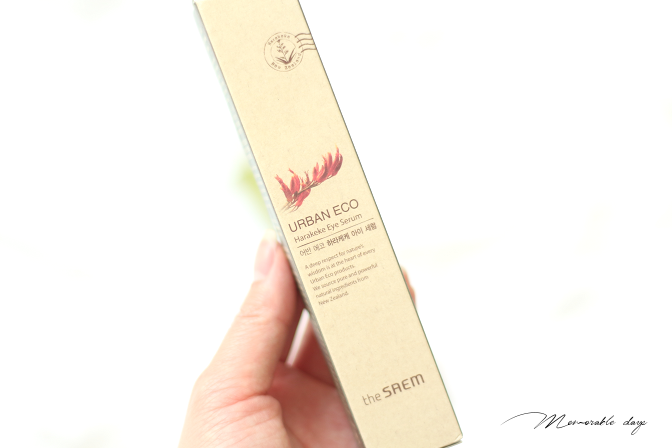 Review: The Saem Urban Eco Harakeke Eye Serum | Memorable Days : Beauty Blog - Korean Beauty, European, American Product Reviews. Wait, what is an eye serum? Isn't it just an eye cream? No! There is a difference! This is my first time trying an eye serum but it's also my first time using anything from The Saem. I normally use an eye cream, so when I first received this I was curious about the texture and benefits of this product. You might recognize this item from my Niasha haul (Korean webshop based in Switzerland). I have been testing this product for 2 months now. Are you curious about it as well? Keep on reading! 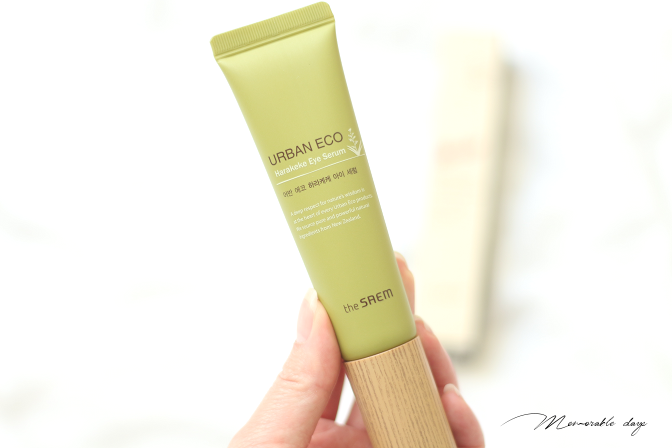 The Saem Urban Eco Harakeke Eye Serum is from their Harakeke line, it is a highly concentrate eye treatment and contains 78% of Harakeke extract, which is a plant from New Zealand. It's suitable for dry and sensitive skin around the eye. It contains 30 ml of product. Free from parabens, artificial colorant, talc & mineral oil. Since a large amount in this product contains Harakeke extract, it's good to know what it actually is. In New Zealand it's called Flax, the gel which is at the base of this plant is actually a skin hydrator with a large amount of natural skin nutrients. The gel helps with controlling sebum, coupled with a natural antimicrobial action, makes it a good defence against breakouts. It's soothing, it hydrates and cools, reducing puffiness as well as redness. Looks like a very good plant with many benefits, it makes me think of aloe vera. Apply an appropriate amount at your eye area, I usually use one pump for both eyes, and gently pat it into the skin to enhance absorption. It can feel a tiny bit sticky when it's not fully absorbed. Can be used in the morning and at night. It's white and has a gel texture. It feels cooling on my eye area. When my eyes are a bit swollen, and I apply this after, it just feels so good because of the cooling effect. My eyes feel less heavy and more awake. The eye serum is easy to spread and doesn't have a scent to it. At first it feels like it just sits on top of the skin, but it takes around 5 minutes to absorb the eye serum and it feels moist after. I recieved this item from Niasha.com which is a webshop in Switzerland. They are selling it for €14,80. Unfortunately there is no English ingredient list to find, not on the packaging neither on their website. It is free from parabens, artificial colorant, talc & mineral oil though. The fact that it contains 78% harakeke extract does give me a good feeling about this product. After using it for 2 months day and night, it stills contains a lot of product in it. I only use one pump for both eyes, so I think it will last for a good 5-6 months. It also didn't break me out and worked very well on my combination dry skin. 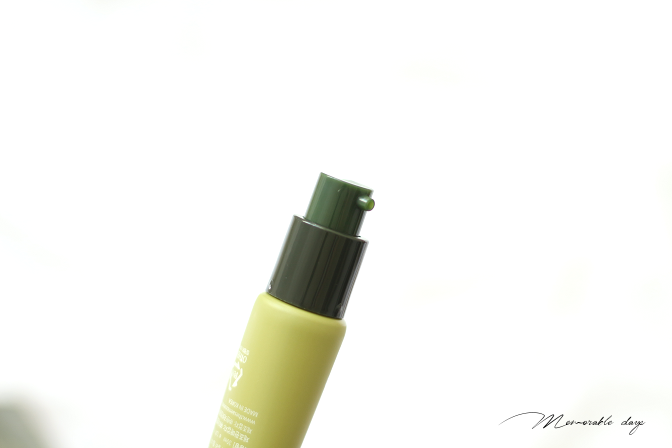 My eye area tends to get oily easily, but this eye serum didn't make it worse nor did it absorb sebum. It made it moist, and the best part is that it cooled and reduced puffiness. It's such a good product when your eyes feel heavy or when your eyes feel swollen. After applying it, it feels very cooling, less heavy and moist. I always feel more awake after applying it. This is not an eye serum with anti-aging benefits, so if you are looking for that, it's better to search for a different one. However if you are looking for an eye product to reduce the heavy feeling & puffiness on your eyes while keeping your eyes moist, this is definitely something for you. I am loving it and definitely will keep on using it.